By making a direct gift of publicly traded securities to the Nelson Community Food Centre, you can achieve far greater tax savings than by donating the cash proceeds from the sale of the securities. When you make a gift of stocks, ETFs (Exchange-traded fund) or mutual funds, you pay no tax on the capital gains earned. This could provide a tax saving of up to 50 per cent. A charitable tax receipt is issued for the fair market value of the securities on the date they are transferred to the Nelson Community Food Centre. 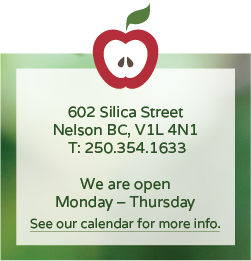 To make a donation of securities to the Nelson Community Food Centre, simply instruct your financial institution or broker to transfer your gift of securities using this form (just click this link). This is a great way to reduce the out-of-pocket expense of making a donation. It’s cost-effective, straightforward and is very much appreciated by the Nelson Food Cupboard.